THE Honourable Minister of Transportation Rt. Honourable Rotimi Chibuike Amaechi has affirmed that the dictates of and total adherence to Maritime Safety and Security imperatives in the nation are critical ingredients of both industry and national growth. Addressing Stakeholders and Newsmen at the occasion of the world Maritime day celebration held in Lagos, the Honourable Minister assured Stakeholders in sub-sector of government’s co-operation in all concerted efforts towards the safety and security of the National waterways. 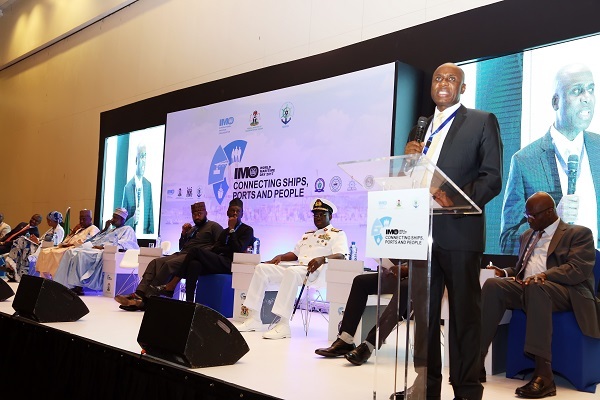 The event under the theme “connecting Ships, Ports and People”, the Honourable Minister stated is a wakeup call for all hands to be on deck in ensuring that the Maritime sub-sector is effectively prepared to attract foreign direct investment. (FDIS) which in turn would impact positively on the growth of the nation’s economy and an increased standard of living of the people. The Honourable Minister told Stakeholders that Government is in collaboration with professional concerning the safety of the country’s waterways adding that the action is in line with best practiced with technology transfer and mentorship being the variable accruable to the nation in the long run when Nigerians would be well trained on the subject. On intermodal system of transportation, he stated that plans have reached advanced stage for the use of rail in the evacuation of cargoes to commence. He pointed out that Government is interested in boosting activities in the sector in order to guarantee employment and empowerment of the teaming Youths who are leaders of tomorrow. Similarly, Rt. Hon. Amaechi encouraged information sharing and synergy amongst key players in the industry. This He said would create the enabling environment for Maritime growth, a principle he considered to be in tandem with the tenets of the ease of doing business. GM, corporate & Strategic Communications.